There are roughly 11M “Road Warriors” in the workforce today. These workers use their mobile devices as their primary method of communications. Until now, these workers were required to use cellular data, 3rd party apps or 2-stage dialing to connect back to their corporate phone system. These methods are cumbersome and have proven challenging for businesses to adopt. With TruMobile, we extend the corporate phone system to the cellular phone without having to change the way you make or receive calls, our integration is seamless to your employees. 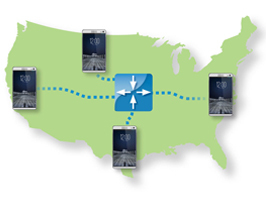 Extend advanced PBX functionality to mobile devices located anywhere in the United States. Mobile workers can finally ditch their desk phones without losing PBX features and device management. TruMobile was built specifically to solve the needs of business customers. TruMobile allows mobile workers access to corporate voice features and services anywhere in the United States while maintaining a consistent user experience.